It does not take long for the news of a hot seller’s market to get around. And one of the by-products is overpricing. Oftentimes sellers are misinformed that they can start their home at a fantasyland price and if it does not receive any offers, they can simply adjust the price down to make the home more marketable. This is risky advice to say the least. You are only new once, and a seller loses a tremendous amount of leverage by choosing to be overpriced while you are new to the market. Most importantly, pricing must be rooted in reality. Meaning, there must be evidence to support a list price when the goal is to generate offers. 1. The buyer. First and foremost the buyer must feel confident that a home is a good value before they will make an offer. The buyer will compare it to other homes that they have toured during their search. They will also review comparable properties that have sold in the area or are currently under contract. This information will be provided to them by their agent. In some cases, the buyer will also seek counsel from family members or friends to help validate their decision. 2. The buyer’s agent. Regardless of how enamored a buyer may be with a home, it is their Realtor’s job to provide them with all of the information that the buyer needs to make an educated decision. In many cases, the buyer will depend upon his or her Realtor to leverage their experience in the market to provide perspective to a buyer. After all, that is why they hired their Realtor to begin with. As a Realtor, we have a fiduciary obligation to our client which means that we act solely in the buyer’s best interest. If the buyer is looking to make a questionable investment in an overpriced home or a home that exposes them to other risks, it is the Realtor’s job to inform them of their concerns and ensure that their client is aware of all of the risks. 3. The appraiser. The final say when it comes to supporting a contract sales price is the appraiser who works for the buyer’s lender. The appraiser is there not to protect the buyer, but to protect the lender. Their job is to prove that the contract sales price can be supported by actual market data. Unlike the first two (the buyer and their agent), an appraiser is not concerned about how much the buyer loves the home, or how long they have been looking, or how many homes that this buyer may have missed out on already in multiple offer situations. The appraiser’s job is to evaluate the property, compare it to other sold properties in the area, and ulitimately determine that if the buyer were to default on their loan for some reason that the lender would get their money back if it were foreclosed upon. Appraisers are under tremendous scrutiny these days. Their appraisals cannot be full of fluff. If so, the appraiser can be penalized. And appraisers work in the market of the recent past. Because they count on sold-property data rather than analyzing inventory levels, they do not give value to homes that are in back-up or pending status. So in an improving market where homes are appreciating quickly, the appraisal may not support a contract sales price that is pushing value. A common misconception is that you can get sloppy with pricing in a strong seller’s market. Nothing could be further from the truth. Strategic pricing is required in all markets. A seller who recognizes this fact will be the most successful when it comes to low days on market and achieving top market value. And remember, your price has to convince three buyers that your home is a fair value. A mild winter plus rising interest rates make for an early start to the real estate market. It seems these days that the market never really stops, to be honest. Seasonality is not as distinct as it was when I began my career in 2004. But has the market already peaked for the year? By peaked, I mean has the perfect storm of low supply plus high demand already happened for the year? It seems that it occurred in February. Typically it occurs in either March or April, but since February the number of homes going under contract when compared to the number of active homes for sale has been dropping each month. This is not normal. See the graphs below. 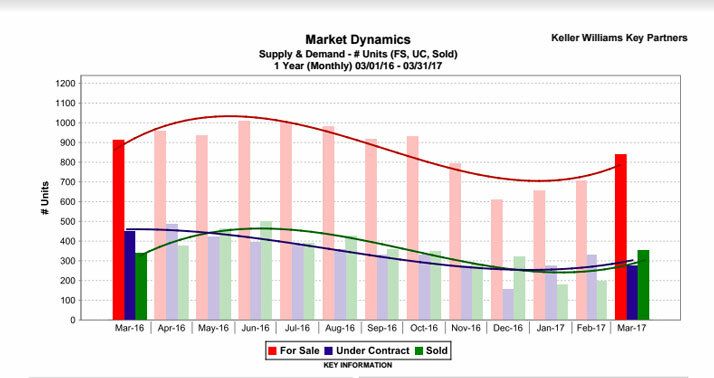 This graph showing housing supply and demand for the last 12 months is comparing April 2016 to April 2017. The number of active homes for sale is down 4.9 percent this year. However, the big story is the number of contracts received. 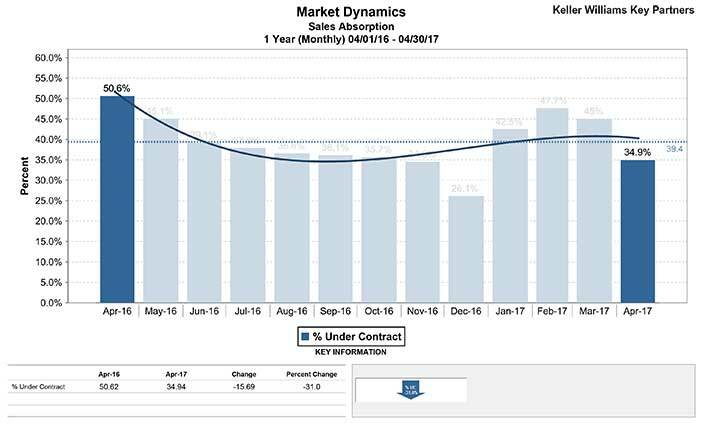 Contracts received are down 34.4 percent from last year during the same month. In April 2017, 319 homes went under contract in the Shawnee Mission School District. That is less than February or March of this year. And notice that the number of active homes for sale has been increasing since January 2017. So supply is going up and demand appears to be dropping. 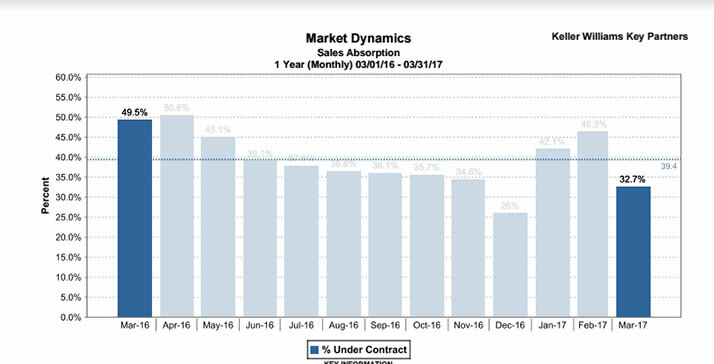 Here’s another graph of note: sales absorption. This graph is where the rubber meets the road. Of all of the information that I review on an almost daily basis, this graph is the most important because it truly shows supply and demand. The most important number for a listing agent to know, in my opinion, is what percentage of homes are going under contract in a given area each month. As the market shifts, and it always does, if you monitor the absorption rate you can somewhat predict where the market is headed. This allows a seller and their agent to price appropriately based on the current market demand. In April 2016, 50.6 percent of the active homes for sale went under contract. That is a fast moving market when one out of two homes are selling. Fast forward to April 2017 and we can see that 34.9 percent of the active homes went under contract. Don’t get me wrong, this is still a good market. It is just not the same market that we saw in 2016. Here are a couple of things to consider. First, the absorption rate of 34.9 percent in April 2017 is as low as the winter month absorption that we saw in November and December 2016. Secondly, the absorption rate in the Shawnee Mission School District has been dropping since its apparent peak in February of this year. As you can see from the graph, historically the absorption rate will continue to drop from April through the rest of the calendar year. If that is the case this year, how will this affect our real estate market moving forward? I will be watching the markets closely to tell you exactly what I see in the coming days. If you are curious about how the shifting market is affecting your neighborhood, please email me today for a free market analysis for your home. Recently, we’ve heard a lot of clients asking if homes are selling “off market,” meaning they never hit the open market for the general public to see. In a seller’s market, off-market sales tend to spike. So the short answer to the question is yes. Pretty frustrating, right? You can bet it is frustrating. Especially if you are a buyer trying to find a home and they keep selling out from under you. “But how is that fair?” you might ask. Well, it doesn’t feel fair, and at the same time it is perfectly within the seller’s rights to do so. You know the old saying, “It’s all about who you know.” This can be very true in a low inventory market. Your Realtor must have his or her ear to the street at all times and be networking with other agents on your behalf to help find you a home. The Realtor community is a tight knit group and with 10 percent of the Realtors out there doing 90 percent of the business, we work with the same agents all of the time. Even more so after the recession. When I started in real estate 11 years ago, there were over 12,000 Realtors in Kansas City. Coming out of the recession, there were less than 7,000. So that 10 percent group has gotten much smaller, which makes it easier to network for upcoming inventory. Don’t get me wrong. The vast majority of real estate sales happen the traditional way. A property is listed with a Realtor, and the Realtor then advertises it in MLS for all the world to see. In my experience, this is the best way to achieve top market value for your home if that is the goal. Now, in some instances it may be more valuable to the seller to sell their home off market and avoid all of the stresses that come with having their home on the open market. For example, we have had clients with lots of young kids at home choose this option. Or perhaps a seller with a really demanding work schedule that requires day sleeping. Ultimately, I want you all to know that there is no secret society of Realtors out there selling tons of homes behind closed doors. We are not all standing in a candle lit room, wearing long robes, sharing top secret information that you will never know about the best real estate that Kansas city has to offer. And at the same time, when you are looking to hire a Realtor (especially in a low inventory market), make sure that you find one who is very active in the market. You want your advocate to be in communication with the Realtor community daily. This is a reasonable question and a valid concern. A concern, I believe, that is preventing many, many sellers from experiencing the joy of today’s market. In most parts of town, a seller’s market still exists. Sellers are receiving multiple offers, homes are selling very quickly, and in most cases the seller is naming his terms. Sellers have only dreamed of a market this good. At the same time another parallel universe exists for buyers. All of the circumstances that I just named that make it great for sellers also make it challenging to be a buyer. When sellers receive multiple offers, only one buyer gets the call that they got the house. The others are left disappointed. Because homes are selling as soon as they are listed, buyers are struggling to keep up. And when sellers are naming their terms they are also working with who they feel is the strongest buyer. So let’s get back to the question: “Will there be a home for me to buy?” The answer is yes. Please let me explain. Today’s market is a skill-based market. In order to feel comfortable selling your home today, you need to know that your Realtor has the skills that it takes to win in this market. Skills like knowing how to draft a winning offer, a constant and immediate awareness of all new housing inventory, and the ability to coach you into the best potential home buyer you can be. Not to mention the tenacity and the stamina to keep up with the fast pace. Succeeding in today’s market is also about setting proper expectations. When buyers and sellers know what to expect, they don’t have as many fears concerning the market. Most potential sellers are feeling the itch to sell because they have a need for something more when it comes to their home. Or maybe it’s a dream that is pulling them into the market. Well, I say dream big! Has there ever been a time when you had to let go of something to get what you want or to get where you needed to be? Well, this time is like that time. I liken it to the monkey bars that we all used to play on as kids. To get from one side to the next, what had to happen? You had to let go of one hand to swing it forward to get to the next bar. It is time to let go again and swing on into the market. Don’t get left hanging on the wrong side of the monkey bars. One last thing: When a great home for you does show up one day, and you are competing for it, do you think that seller would rather accept an offer from someone who had a home to sell or someone who had cash in hand and coming to them because their house had already sold? Of course, the cash in hand buyer will win every time. If you want to show a seller how committed and motivated you are you must sell your home first. In a low inventory market, the goal is to eliminate any potential objections that a seller might have of you as their buyer. I love my job. I really do. I have the pleasure of working with sellers all over the city and from all walks of life. Just this week I will be consulting with seller clients in Leawood, Roeland Park, Kansas City, Kan., North Kansas City and Brookside. And just this quarter we have listed and sold homes in values ranging from $109,900 to $425,000. Although each home and seller is different, there are some common misconceptions that come up quite often. I thought that I would share a few of them with you this week. The definition of fair market value for a home is a selling price to which a buyer and seller can agree. Although a seller may have a goal number in mind when it comes to sales price, the buyer must also see that the sales price is in line with the pending and sold comparable homes in the area. Coming out of the down market, buyers are still very concerned with making a smart investment. So even if a seller has put $80,000 into home improvements, most buyers are aware that at best a seller will receive 60 percent of that investment back in the sales price. And what a seller paid for a home is no more relevant to market value than what a stockholder paid for a share of stock three years ago. A share of stock and a home’s value are completely based on today’s market and the effects of supply and demand. Yes, it only takes one buyer. But wouldn’t you like the opportunity to pick which one? When your home is at a price or in a condition that only one buyer has an interest in purchasing it, you have to work with that particular buyer. Conversely, when your home is at a price or in a condition that multiple buyers have an interest in purchasing it, you get to pick the best one. Isn’t that really what you want? Usually, “It only takes one buyer” is the battle cry of a seller who is overpriced or has a home with some condition challenges. Maybe the decor is a bit “personal” or the home is outdated compared to the competition. Waiting for one buyer to come along puts the buyer in the driver’s seat. Pricing a home competitively in line with the current condition will keep the seller in the driver’s seat and attract the largest number of potential buyers. What’s the harm? The harm is that how you show a home and how you live in a home are different scenarios altogether. To position a home for sale requires thinning, staging, de-personalizing, and allowing access to the market for showings. It is not easy. However, to the motivated seller it is worth it. It may not be worth it to a “trier.” The real estate market is really intended for those who NEED to sell and those who HAVE to sell. Sellers who need or have to sell will do everything it takes to attract a buyer, including a competitive price and presenting their home in great condition. In return, they will attract buyers. I find that motivated sellers attract motivated buyers. The opposite also applies. Unmotivated sellers (triers) attract unmotivated buyers (triers). This is why many of the FSBOs that eventually hire us to sell their home will share that they encountered a lot of “looky loos” during their time as a FSBO. Because a home listed with a Realtor cannot be shown without either the listing agent or a buyer’s agent allowing access, “looky loos” tend to stick to properties that they themselves can access. Mild winter + low interest rates = an early start to the real estate market in KC. That’s right. The market started kicking in to gear in January and has kept a steady pace since then. We have already seen several multiple offer situations on both the buying side and selling side of our business this year. However, the frenzy-like sales seem to be more price point driven this year than last year, when all price ranges were seeing bidding wars. Last year, starting in July, I began sharing signs that we were seeing a shift in the real estate market. A shift towards more of an equilibrium (balanced market) versus the “way out of balance” seller’s market that we have been in for the last three years. So how is this year looking so far you ask? Let’s let the numbers tell the story. The Shawnee Mission School District area ended 2016 with 2.4 months of supply of housing. The average months of supply for the last 12 months in the SMSD area is 1.4 months. Just as a reminder, an annual average of three months or less is considered a strong seller’s market. 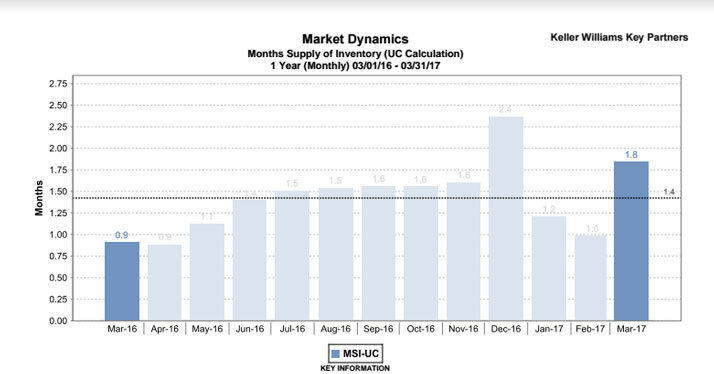 It is not atypical to end the year with the highest level of inventory for the calendar year. That is usually the typical seasonal trend. Then we see that January kicked right into gear cutting the available housing inventory in half bringing us back down to 1.2 months of supply. February continued the trend even further lowering the inventory. So, a pretty robust start to the year — that is, until March. 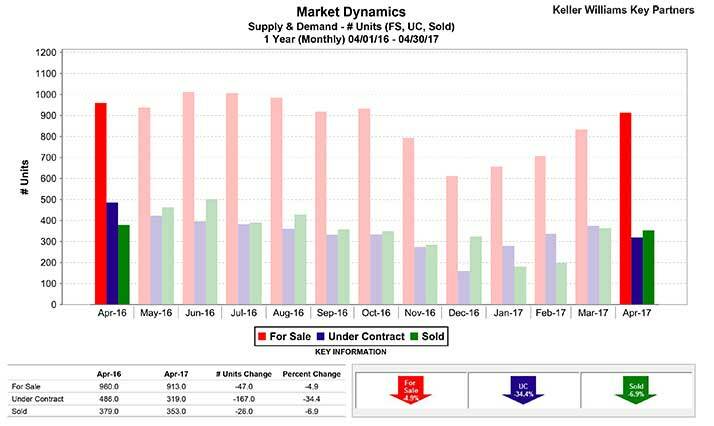 The inventory levels nearly doubled from February 2017 to March 2017. To clarify, by inventory levels I mean how many months it would take for all of the active homes for sale to go under contract in a given area. I say that because the number of homes for sale always goes up from February to March. That is nothing new. The difference this year is that the number of contracts received when compared to the active homes for sale actually dropped this year from February to March. See the graph below. This graph shows the major difference between March 2016 and March 2017. In March 2016, 49.5 percent of homes for sale went under contract. That is an incredible number. When almost one out of two homes in going under contract in a given month, the market is moving at an incredible pace and bidding wars are prevalent. The housing absorption in March 2016, as high as it was, virtually eliminated the available housing inventory, taking the SMSD area down to 0.9 months of supply. Starting the spring season with barely any available housing set the stage for last year’s seller’s market bonanza. Fast forward to March 2017, and only 32.7 percent of the homes for sale went under contract. This is still a good pace, but pales in comparison to March 2016. Most important is the fact that the absorption rate has dropped from February 2017 to March 2017. Historically, the absorption will increase from February to March, not decrease. And the decrease was pretty significant (from 46.5 percent in February to 32.7 percent in March). This decrease in demand for housing is the trend to watch very closely. Here we see the supply and demand for housing in the SMSD area from March 2016 to March 2017. The comparison below the graph is illustrating the change in the market based on supply and demand. You can see that the number of active homes for sale is down 8 percent (from 914 to 841) from March 2016 to March 2017. Now, here is the big story…drum roll please. The number of homes to go under contract is down 39.2 percent (from 452 to 275) during that same period. That is a huge difference! Some say that sky-high home prices have caused the drop in demand. Others say that many home buyers purchased in January or February of this year in order to secure a lower interest rate due to the fact that rates have been on the rise since the election last year. I say that they are probably both right. But regardless of the cause, the story is that the market is always shifting. From a seller’s market to a buyer’s market and then back again. And there are many other markets in between the two. My goal is to keep you informed of where we seem to be headed (in real time) so that if you have any upcoming real estate plans, you can plan accordingly. If you are curious about your specific neighborhood or price range is being affected by this shift, please call or email me today. The title of this column almost feels like the “Top 10″ segment on David Letterman’s Late Show, but this list is no joke. That’s right: There is no humor in getting your home and keeping your home ready to show at a moment’s notice all day every day and then never receiving an offer. In fact, I would say it’s downright depressing. 1. Overpricing: I have mentioned before that only 30 percent of buyers are willing to pay up to 10 percent over fair market value for a home. If it is priced more than 10 percent over market, the percentage drops even more. So overpricing your home eliminates 70 percent of your potential buyer pool on day one. In an improving market like ours, there is a little breathing room when it comes to pricing. But I mean little. One might be able to price a home at $225,000 instead of $220,000 (the current market value) and count on appreciation to pull your value up. It does happen. However, in our example the difference in price is only 2.2 percent and the seller would still need to be prepared to adjust if the market did not respond in short order. This is where a Realtor and their seller must have a clear understanding of fair market value based on recent sold and more importantly (in my opinion) pending comparables. 2. Competition: “It’s a price war and a beauty contest.” I have said that a million times and it still holds true today. The moment that a seller decides to sell their home they have also decided to enter a contest. A contest in which the competition changes almost daily. One day you might have three homes that you are competing with and then wake the next day to find that you have three more. Double the competition in 24 hours! Can you see why staying ahead of the market is important? A seller must also know how many homes are selling each month (absorption rate). If three homes are selling each month and there are twelve for sale in a given area, then it will take four months for all of them to sell at the current rate. AND if you must sell in the next 30 days you better know that you are confidently in the top three when it comes to condition and price. Otherwise, you will be waiting until next month. 3. Deferred maintenance: Yes, it is true that in a low inventory market buyers are more forgiving when it comes to the condition of a home. That said, I believe that it is more accurate to say that buyers are willing to overlook functional obsolescence and outdated areas of the house. They are not, however, too excited about inheriting a lot of deferred maintenance. When buyers see repair items that should have been repaired by a seller but were not, it begins in their minds a narrative of habitual neglect. And in many cases, a buyer will choose not to consider the home for purchase. If a seller’s home is in disrepair, then it must be repaired before it can compete in the open market. If it just needs updating, price it accordingly and jump into the race. This week I was speaking with one of our clients who has been with us since the beginning of our real estate business. Now in my 13th year in the business, I greatly appreciate those who trusted me way back in the day when I was fresh out of the restaurant business and, frankly, didn’t know too much about real estate. This great client and her husband own about 30 rental properties in the Kansas City area. I actually met them when in the late 1990s back when I was still working at Houston’s on the Plaza and was tired of renting apartments. I was referred to them through an apartment search company, and from the first meeting I knew we would be a good fit. Their properties were well maintained, cute, and in great locations. The funny thing is that my timing was just off enough that I never got to them fast enough. Every time I was ready to sign a lease, someone else had slid in just before me. Although I never rented one of their properties, the relationship stayed intact. Fast forward to when I started my real estate business when I had a chance to reconnect with the great couple again. And now, I could be of service to them. So back to my conversation earlier this week. The first rental of theirs that I looked at was in Fairway between 59th and 60th Streets on Buena Vista. It was a two-bedroom, one-full bath home on a crawl space. It did have a little bonus office space off to the side, but it was small. Probably around 800 square feet. At the time, it was renting for $895 a month. That same home today is renting for $1,200 a month. That is approximately at 30 percent increase. The demand for apartments and home rentals is tremendous right now. Some attribute it to inflated real estate values. Some say that the low inventory of housing for sale has frustrated a lot of buyers to the point that they have just given up and rented. Or perhaps they just don’t want to compete with other buyers for the same home. Whatever the reason, there is no lack of renters out there. But here is the part that I don’t understand. I just mentioned that the modest little home in Fairway is currently renting for $1200 a month. That same home would list for approximately $180,000 today. At a $180,000 sales price financed over 30 years with a five percent down payment ($9,000) at 4.25 percent interest rate, the mortgage payment would be $841.22 a month. This amount does not include taxes and insurance. But even if I estimate high taxes and insurance, in many cases the total mortgage payment would be less than $1,200 a month. So why rent? In many cases, renters choose to rent because they have too much debt to be approved for a home loan. Or they lack the down payment required to make a home purchase. Some have not-so-great credit scores which affect their ability to obtain financing as well. Regardless of the reason, I would strongly urge the renters out there to create a plan that will get them on the path to home ownership. Just this week the Fed once again raised its benchmark federal funds rate by 0.25 percent. Although this does not directly affect the interest rate that a consumer will pay on their home loan, it does indicate the tightening of the Feds monetary policy. Rising interest rates will have the greatest affect on many potential home buyers out there. As rates go up, affordability will slowly slip away. Remember the scenario we mentioned earlier? With a 4.25 percent interest rate, the mortgage payment on that little Fairway home would be $841.22. If rates even go up 0.75 percent to 5 percent, that same little house would then have a mortgage of $917.96. The almost $80 difference may not seem like a big deal to some, but for a first time home buyer it can be a very big deal. My message today is that if you or someone you care about is currently renting, please consider that the opportunity to purchase a home at a very affordable interest rate is slowly slipping away. The Fed has said that they will raise rates two more times in 2017. So the writing is on the wall. If you are facing one of the obstacles I mentioned earlier when it comes to buying a home, please reach out to a trusted Realtor to create a plan for your home buying future. If you would like more information about the steps to buying a home, please contact us today. We would love to help. The phones have been ringing off the hook since the Johnson County appraiser’s office notified homeowners of their home’s 2017 appraised value. As the Post reported earlier this month, the Johnson County valuation jumped up 7.9 percent in the last year and cities in the Shawnee Mission area like Prairie Village skyrocketed by as much as 11.9 percent. Our clients and friends have been caught off guard, to say the least, by such a significant jump in one calendar year. And understandably so. The 2017 increase is the biggest that we have seen in six years. Please know that I am all for fair taxation. We have to keep the coffers full somehow, right? But I do have a concern about these new 2017 numbers. Let’s use Prairie Village as an example. The average sales price in Prairie Village in 2016 (585 homes sold in MLS) was $298,223. As we know, this average was calculated by adding up all 585 of the sale prices and then dividing them by 585 to get the average sales price for the year. My concern is that 21 of those sales were more than $750,000 with several of them over the $1 million mark. The downside to using average sales prices is that really high or really low numbers on the spectrum can skew the results. And in this case I believe that they do. The median sales price for 2016 in Prairie Village was $250,000. With a data set as large as 585 sold properties, in my opinion, the median is a better representation of how the market is performing versus the average. The median is found by placing all sales prices in value order and then finding the middle value in the data set where half of the sales prices are higher and half are lower. Most important is that each city, subdivision and neighborhood perform as their own market within a market, so it is important to know how your market is performing. For example, the homes close to the Village Shops have seen a sharp increase in demand (and value) due to the tear-down phenomenon that is currently taking place. The value of a four bedroom, two full bath Cape Cod south of 75th Street is not as valuable as the same home north of 75th Street. And then if it is within walking distance to the shops, the value is even higher. Therefore, the appraiser’s office is at a disadvantage. They have not been inside these homes, nor do they study each and every market like I do. So I don’t want the takeaway from this column to be that Johnson County is trying to manipulate the system. Rather I see that the system for real estate taxation as antiquated and oftentimes inaccurate. The county’s website does encourage a homeowner file an appeal if they feel that their appraised value is higher than what fair market value might be. And I applaud them for that. The one caveat is that you only have until the end of March to make your appeal. Unrealistic and abrupt tax increases do have consequences. Just last night my wife, Leah, was speaking with one of her clients who were strongly considering an offer on a Johnson County home. That was until the new taxes were revealed to them. The new figures placed the home out of their financial comfort zone. Just like rising interest rates, rising taxes can have a direct effect on the overall real estate market. At the end of the day, it is all about affordability. Finally, my concern is that the new tax values are representative of a market that we are no longer seeing. Although most of the Shawnee Mission School District is still in a seller’s market, the demand for homes is not as high was it was at the same time last year. Again using Prairie Village as an example, the percentage of homes for sale that went under contract in February 2017 (41.5 percent) is down 14.6 percent when compared to February 2016 (48.6 percent). The SMSD has seen a 15.4 percent drop in demand when the two months are compared. Less demand leads to more supply, which leads to more competitive (or lower) home values. Just something to consider.